Handmade textured terra-cotta (clay) beads in assorted shapes and colors for crafting jewelry or decorating clothing. After Baking the clay we have given different finish to bead so that more beauty is added to it. Design and Size As per pictures shown and we can please manufacture it according to your designs, size, colors, etc. We are well-established organization successfully operating from Hapur(India); we are a reliable name in the sphere. Made using superior grade materials, our products are quality assured and as per international industry standards. Offering Terracotta Clay beads that have a circle and dot mimicking an eye which is very used in making beautiful bracelets and jewelries. We offer to our customer an exclusive and wide variety of clay beads that are distinguished by their specific colors, variety in sizes and shapes. Our capacity of providing in accordance to clients specifications has made us a preferred choice by our clients worldwide. 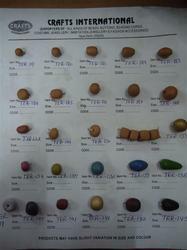 Our clients can avail from us superior quality of Clay Beads. 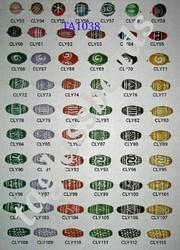 These beads are available in various designer colors and patterns. Widely known for their eye catching appearance and performance and are available at economical prices.